Tara offers a series of packages, which can take you to Chong Kneas, Kampong Phluk or Kampong Kleang. Browse places to stay in Siem Reap on Booking.com. Book Now - Pay Only When You Stay. The Tara Riverboat itself is at Chong Kneas and you are brought there by a small, guided engine boat up a channel and out on to the lake. The Chong Kneas sunset tour includes a trip to the Gecko Environmental Centre, a two-course dinner and unlimited drinks. The day tour includes the meal and just one drink. Chong Kneas is now very congested, and being bombarded by boats filled with young kids wielding snakes and begging for cash is not a pleasant experience. Kampong Phluk and Kampong Khleang are much less touristed, and Tara offers trips at $72 and $60 respectively. 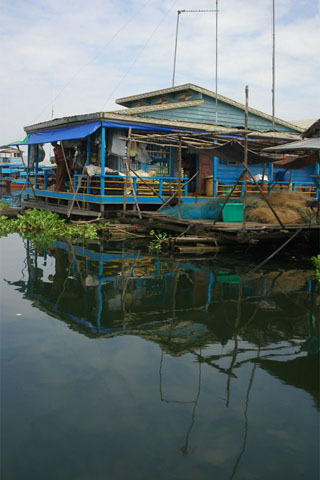 They also go out to the Prek Toal floating village which borders a conservation area for numerous breeds of water bird whose populations are now recovering from gross over-hunting under the careful attention of the Wildlife Conservation Society. This trip is further out and more expensive, but ultimately more rewarding than the others. All packages include hotel transfers from Siem Reap.